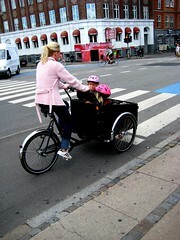 A little batch of Copenhagen Cargo Bike Supermum photos from last week. 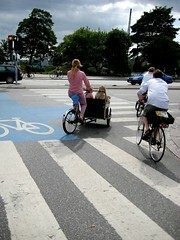 Coincedentally, four of them riding Christiania Bikes. Above, a crossing moment on the King's New Square under moody clouds. The canopy helps in the event of rain. Waiting for the light to change. The two kids in the box were sitting on their bench reading library books. How lovely is that? 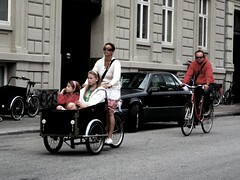 Another classic Copenhagen transport shot. A family out for a ride. 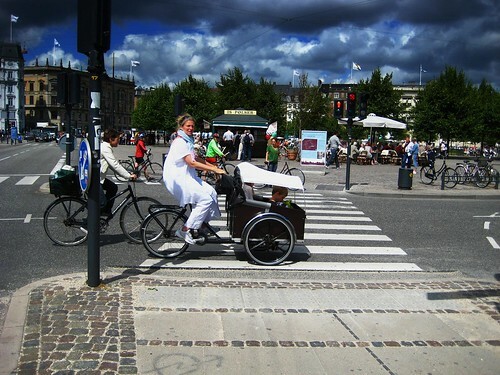 I suspect they might be tourists, but that is wonderful that they are seeing the city in a Copenhagenized state. 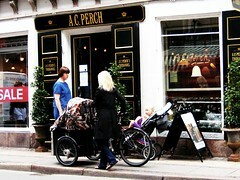 And here's a Nihola bike with camoflage canopy outside Europe's oldest tea shop, A.C. Perch's Thehandel. My friend Christian's family have been running the shop for generations. They've just opened a tea salon upstairs. Even if you don't drink tea, pop inside for an aromatic experience. They do a great online sales service as well, shipping to tea lovers all over the world. We're pleased that our Cycle Chic message is spreading. One of our readers, Lisa, sent us this link from the Canadian newspaper The Globe & Mail. Copenhagen Cycle Chic Goes To Canada. Based on the tone of the article, it's as though the journalist JUST realised that it is possible to ride in style and in heels. It's a bit corny the way she explains things, but hey, it's all good news for Cycle Chic. Well, it's the Globe and Mail.... I wouldn't expect much of an enlightened view of cycling from them at the onset of a bike revolution. I'm just happy we're convincing people that they can ride without spandex and spd bike shoes here. Since the start of the summer I've seen female cyclists in normal clothes jump incredibly in number. The men still seem to be about the same. Note: that is purely my observation, I haven't gone around counting. All of your photos (and tags) convinced me to try wearing a dress, which I did last week. Today, I wore a dress and heels. It's much easier than I expected, and I'm thoroughly enjoying it. People are shocked when they see me, but I tell them it's easy and fun. Thanks, too for your Style Over Speed blog. That's my new mantra. samuel, you'll see lots of men, as well as women, cycling in normal clothes - and often very style-conscious, whether office or more casual wear - here in Montréal. We do have some of the lycra louts, but probably fewer than in English-speaking North America. CCC, alas you have described Amy Verner's writing very accurately, for someone who has had so little exposure to it. She is also very prescriptive, for a young woman. She came out against "cleavage" in the workplace - hey, cleavage happens - and I believe said women should wear pantyhose (sheer tights) at the office even in summertime. Well-known fashion plate Princess Diana famously did her summer walkabouts sans stockings, and in Paris, many chic women never wear them in the summer heat. That said, anything that can convince people to make cycling part of their daily lives is good, corny or not. That's just wonderful to hear, wordnerdy! Thanks so much. lagatta: alors... les quebecoise á plus du style. vive la velocouture Montrealais.